We went to Hawaii a couple of weeks ago for a cousin’s wedding. We had absolutely no ulterior motives in going, such as escaping the Canadian not-so-spring and the opportunity to explore the food scene somewhere else. Definitely not. But we had to eat. We had to eat at Kimukatsu where the katsu is pounded thin and piled 25 layers high before being breaded and deep fried. We had to eat at Migrant where I had the most refreshing Pele Colada (recipe coming soon!). We had to eat at Morimoto Waikiki where the service was shabby but the yellowtail pastrami was delicious. We had to eat too many fresh and warm malasadas from Leonard’s bakery and then not eat for the rest of the day (almost). We had to try spam musubi at Musubi Café Iyasume. And finally, we had to eat at The Pig and the Lady. Among the seemingly endless string of amazing dishes in The Pig and the Lady’s tasting menu, one dessert really stood out to me. So much so, that I decided to recreate it at home. Apparently their dessert chef is known for creating odd combinations and not everyone at our table liked this dessert, but I did. 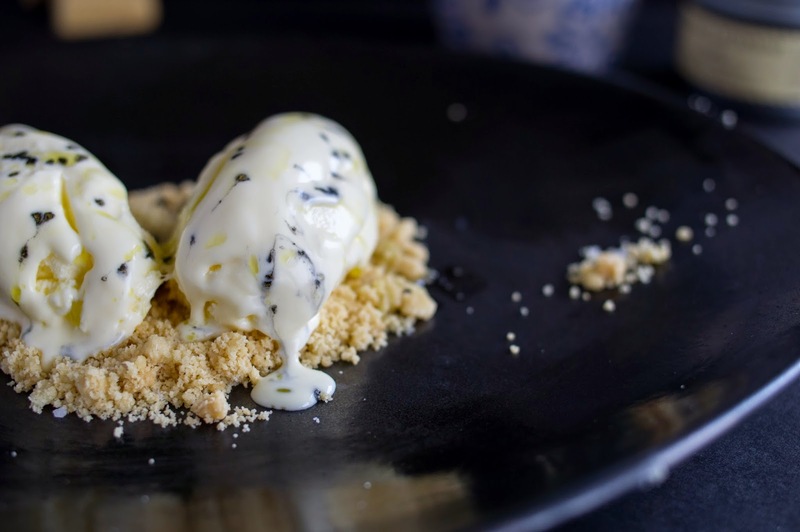 The creamy tanginess of the cream cheese gelato paired with the crunchy cookie saltiness, and the umami of the truffle oil was confusing in an exciting way. One bite I felt like I was eating something savory and the next I was sure it was dessert. In the lab we often have to try and reproduce experiments that other people have done, often with limited success. But in this case I didn’t even have a vaguely written methods section to work off of. I was on my own. I decided to use David Lebovitz’ recipe for crème fraiche ice cream as a base. To that we add crumbled shortbread and a drizzle of truffle oil. The first time I made this I used straight truffle oil, but I found that I couldn’t use enough of it to get an even distribution without overpowering everything. The solution was to mix it with a good olive oil until you get your desired level of truffle flavour and then drizzle on freely. The other ingredient that I found missing when I first made this dessert was salt. Maybe my shortbread wasn’t salty enough, but without adding some extra salt to the dish I couldn’t quite recreate the balance of flavours that I remembered from The Pig and the Lady. The solution: a daring sprinkle of black Hawaiian sea salt to finish. 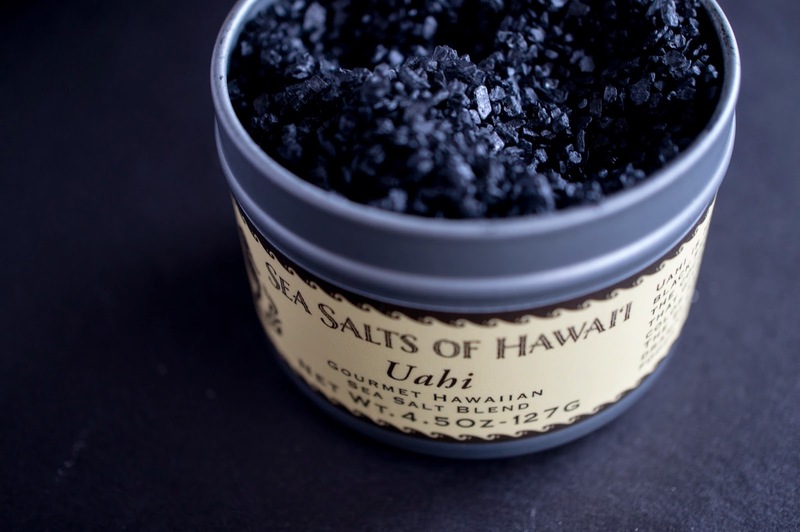 If you don’t have black Hawaiian sea salt, any finishing salt will work. Crumble shortbread cookies onto a serving dish. 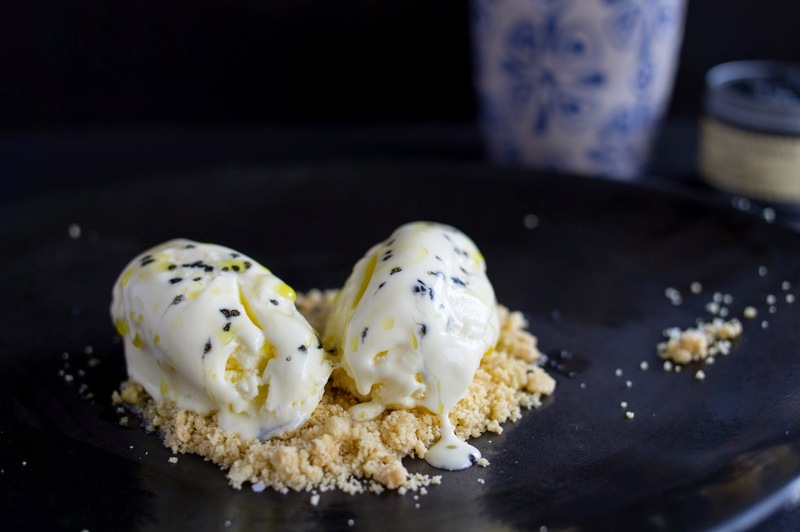 Top with ice cream. 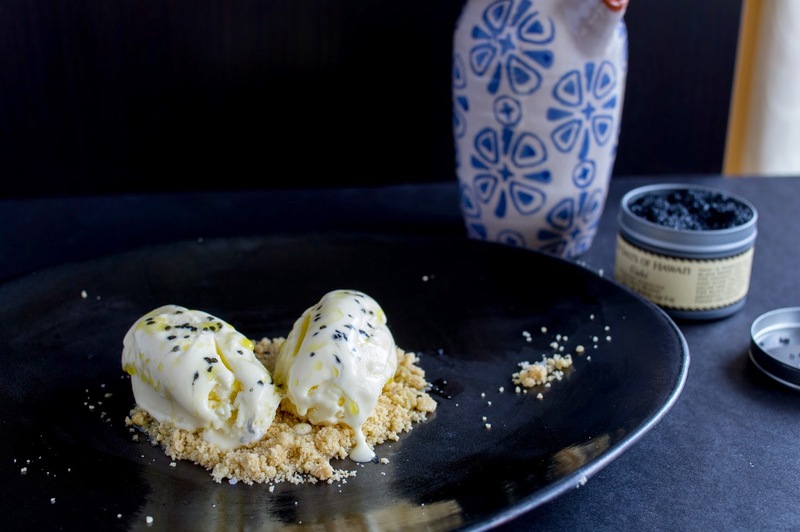 Mix olive oil with truffle oil and drizzle over ice cream. Sprinkle with finishing salt. Prepare a medium bowl with a strainer set on top and place into an ice bath. Combine milk, sugar, and salt in a medium saucepan and heat gently until sugar is dissolved and milk is almost simmering. Meanwhile, whisk the egg yolks in another medium bowl. Once milk is done, slowly pour it into the egg yolks, whisking constantly to make sure the eggs don’t cook. Pour the whole thing back into the saucepan and continue to heat until the mixture thickens enough to coat the back of a spoon. Pour thickened custard through the strainer into the bowl in the ice bath. Stir until cool to room temperature. Cool completely in the refrigerator, preferably overnight. Before churning, whisk in crème fraiche. We don’t leave the crème fraiche in overnight because it contains live cultures of bacteria just like yogurt or sour cream. It would react with the milk and turn the whole custard sour! Churn according to your ice cream maker’s instructions and allow to chill until scoopable. Hello! My name is Rachel and I'm the Pastry Chef at The Pig & The Lady. I was so excited to see that you loved our dessert so much to recreate it. 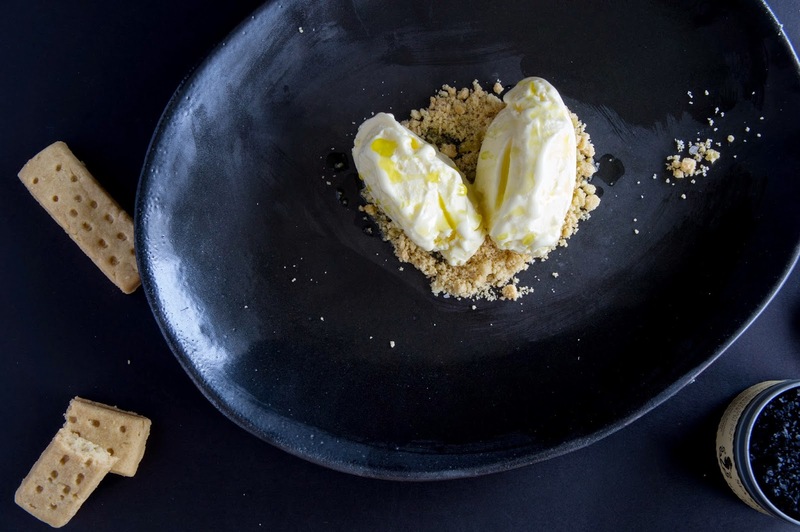 The crumble under the Gelato is made with almond meal and olive oil. 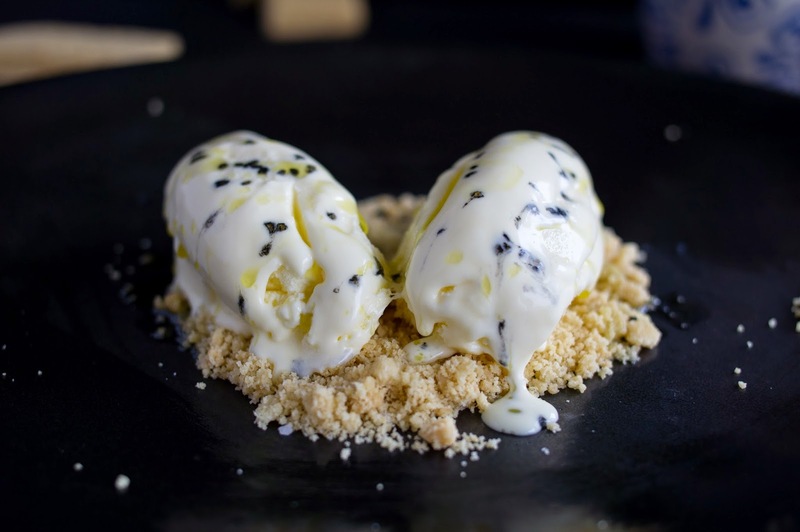 We scoop the Gelato and then top it with a sprinkle of Maldon sea salt and a drizzle of truffle oil (or when in season, shaved truffles). I hope this helps! Hi Rachel, I am so excited that you read my blog post! Thanks for the tips, and we'll definitely be back at the Pig and the Lady next time we're in Hawaii (I am determined to have a "next time").